With so much publicity and hype surrounding Ai WeiWei‘s much anticipated first major U.K. museum exhibition, would it – could it – live up to the high expectations? TheEye admits she was apprehensive. Ai is the world’s most articulate and outspoken artist whose presence on social media has kept him constantly in the public eye, despite the fact that for several years he was unable to be a physical presence. Confinement, surveillance, unendurable harassment and constant clamping down by the Chinese authorities did not deter his creative outpouring. Dispossessed of his passport, his commitment to creative freedom never wavered. Several themes have motivated Ai throughout his life – human rights, freedom of expression and the cultural history of China. 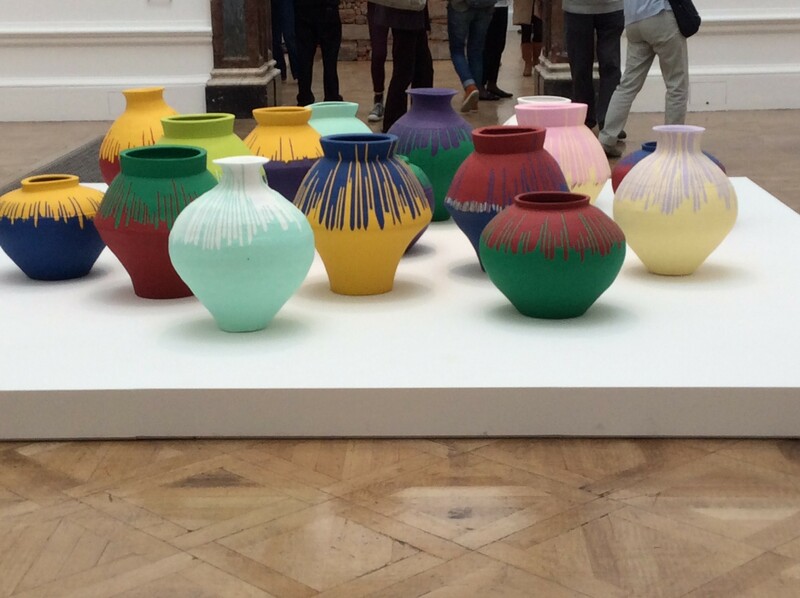 Coloured Vases – Neolithic urns that have been intentionally defaced and painted over. Born in Beijing in 1957, his mother Gao Ying was a writer and his father Ai Qing, a poet (and the major influence in his life) renowned for his crusade of self-expression, concern for the Chinese people and human rights. 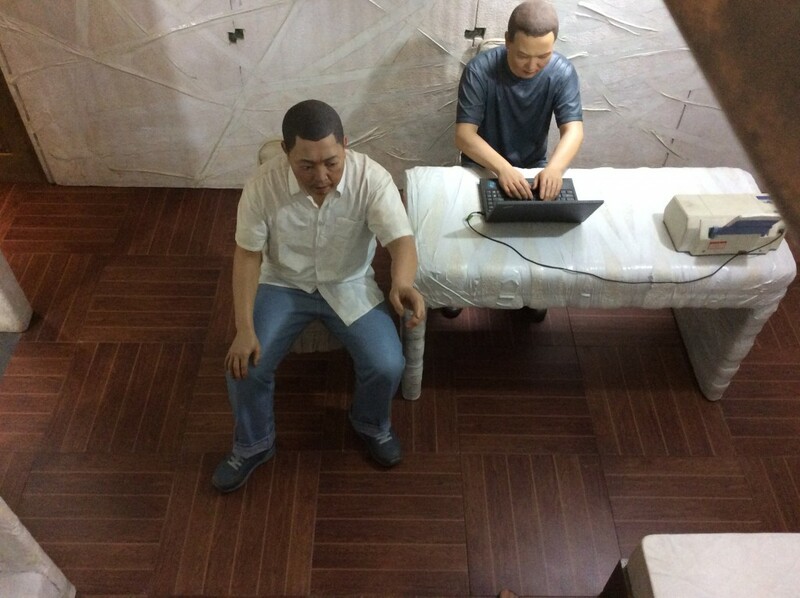 The family lived in exile after his father was sentenced to hard labour and forced to clean the fifteen communal toilets in the village during the Cultural Revolution. ‘Home’ was a hole in the ground covered by brushwood. Out of necessity Ai learned to make furniture, clothes and bricks. The conditions, he says, were ‘extremely harsh and education almost non-existent’. But he was well versed in the teachings of Marx and Lenin. Six part work composed of six dioramas in fibreglass, iron, oxidised metal, wood, polystyrene and sticky tape. 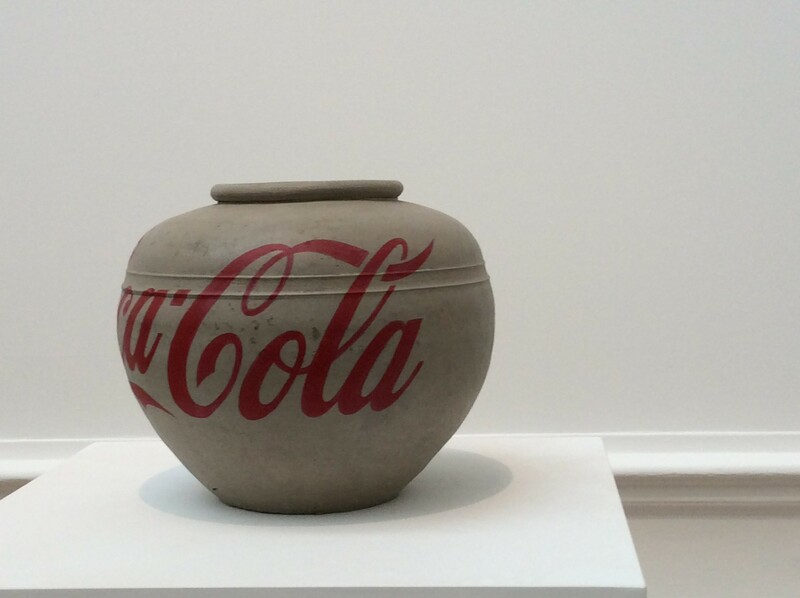 COURTESY AI WEIWEI STUDIO AND LISSON GALLERY. Under constant surveillance – no activity respected! 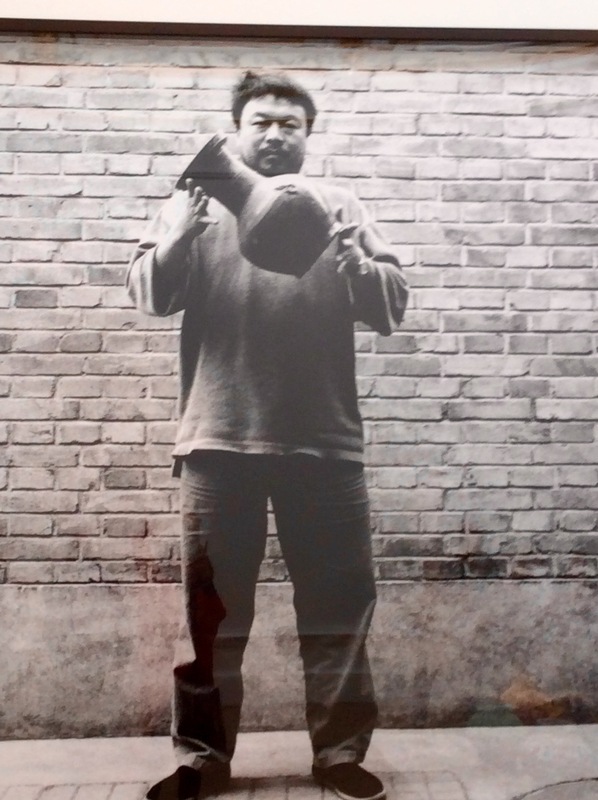 Ai WeiWei was arrested on April 3rd, 2011 at Beijing Airport. 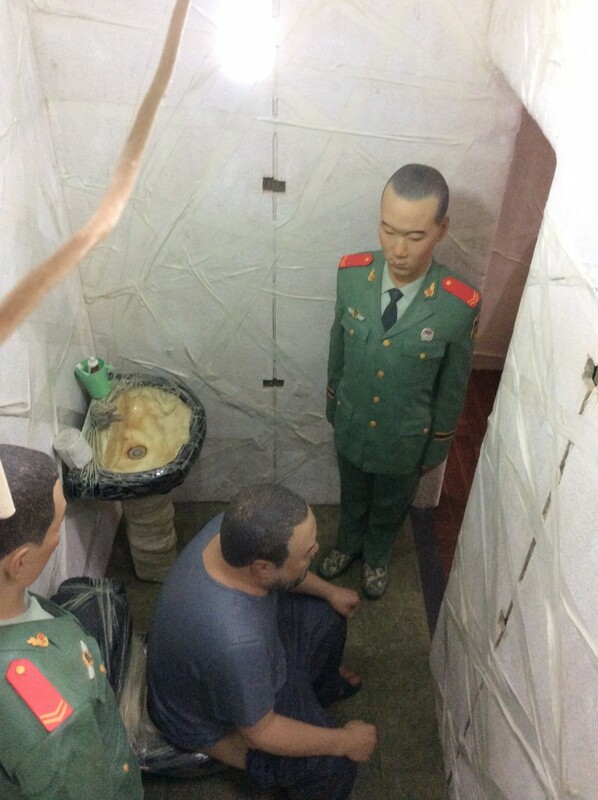 He was illegally detained at a secret location for 81 days and watched over 24 hours a day by two guards who were forbidden to communicate with him. He memorised every detail of his cell. The furniture was wrapped in plastic. After his release he was forbidden to discuss this incarceration and placed on parole for 12 months. His passport was withheld. He was able to re-create six models of his cell. Half the actual size. This brilliant work reveals how degrading his detention was. After his release he was formally charged with tax evasion and denied the right to defend himself in court. The public offered their unsolicited support by giving him money – either throwing it over the wall of his studio compound or online. Ai responded with I.O.U. 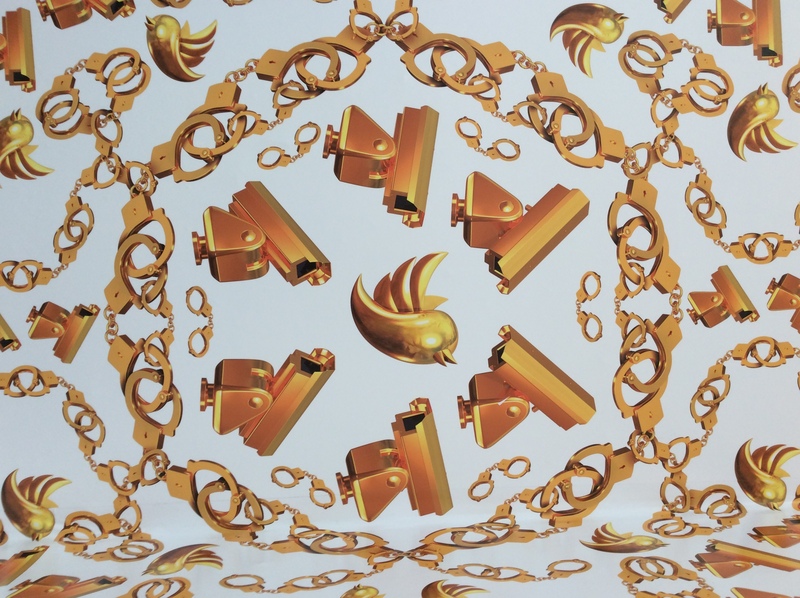 which were notes to each of the 30,000 donors which were scanned and turned into wallpaper. Genius. 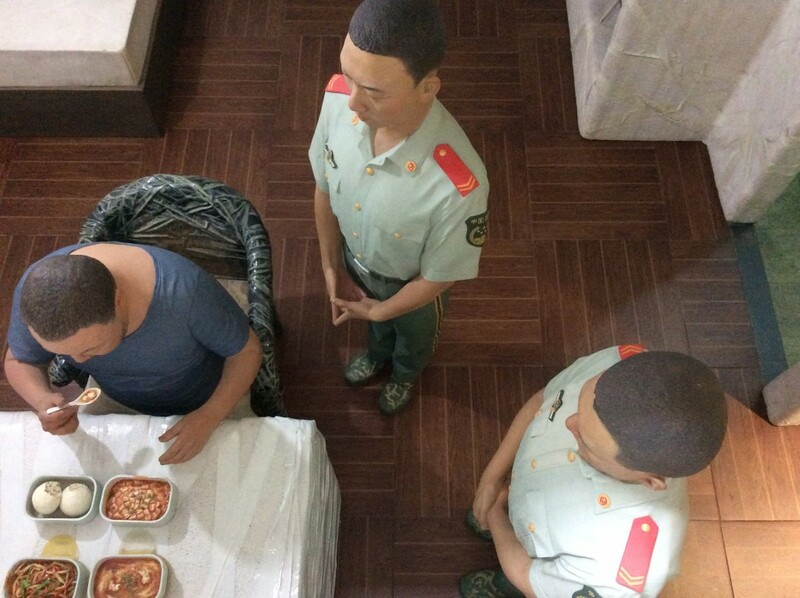 After the death of Chairman Mao in 1976, the family returned to Beijing and Ai attended The Beijing Film Academy where he studied animation and in 1979 became one of the twelve members of THE STARS forbidden to exhibit their work in the China Art Gallery. Undaunted they displayed it on the railings outside. The police declared it illegal and closed it down. After studying at several universities in the U.S. he settled in New York where he remained for 11 happy years and it was the illness of his father that resulted in his return in 1993 to Beijing. Ai Qing died in 1996. The major influence in his life. 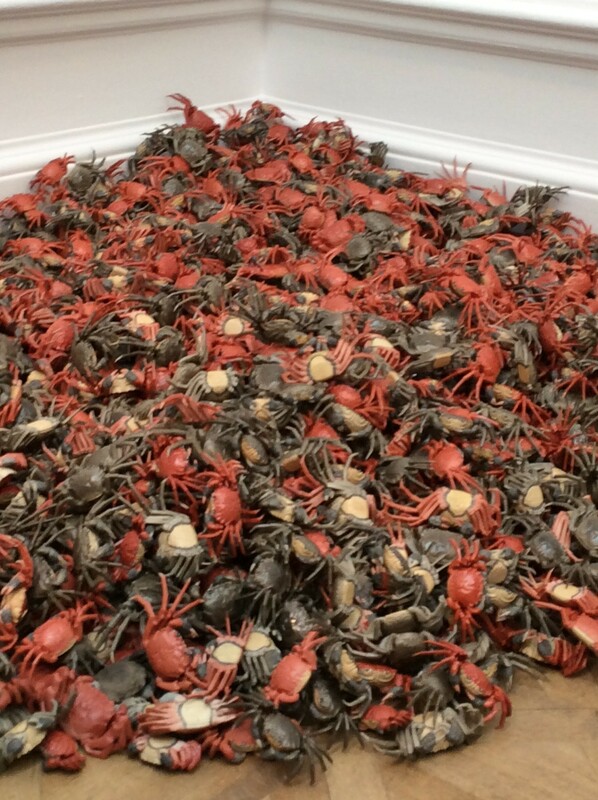 After the studio Ai built in Shanghai was demolished (authorities falsely accusing him of not applying for the correct building permits), in typical fashion Ai tweeted an invitation to the public to join him for a feast of river crabs. 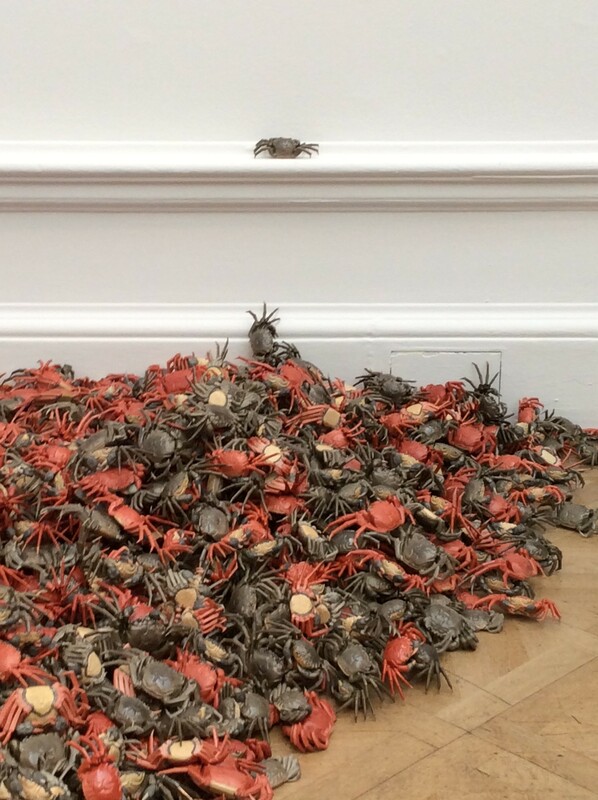 Unable to attend his own party, 800 guests enjoyed a sumptuous feast which included 10,000 crabs. The ceremony was broadcast internationally. Ai WeiWei is unique and this large, comprehensive exhibition offers an intrigued public a tiny glimpse into his world. His commitment of standing firm to the belief that ‘you have to use your own experience to tell a story‘ uses art to demonstrate injustice in China. 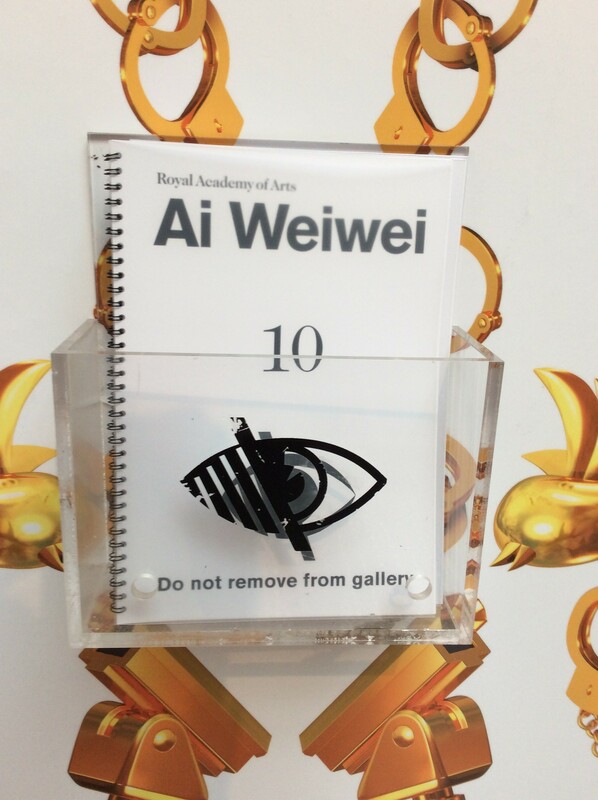 TheEye, like numerous others, has (very slightly) witnessed the controlling practices of the Chinese authorities. Several years ago she worked with students at the The Design School of the Chinese Academy of Fine Art (CAFA) in Beijing, curating a show of their work to be exhibited in London. Its purpose was for people in the West to appreciate how China was fast developing into a country where design and originality thrives, highlighting work that was designed in China, rather than simply ‘made in China’. No rip offs, no copies, nothing derivative. 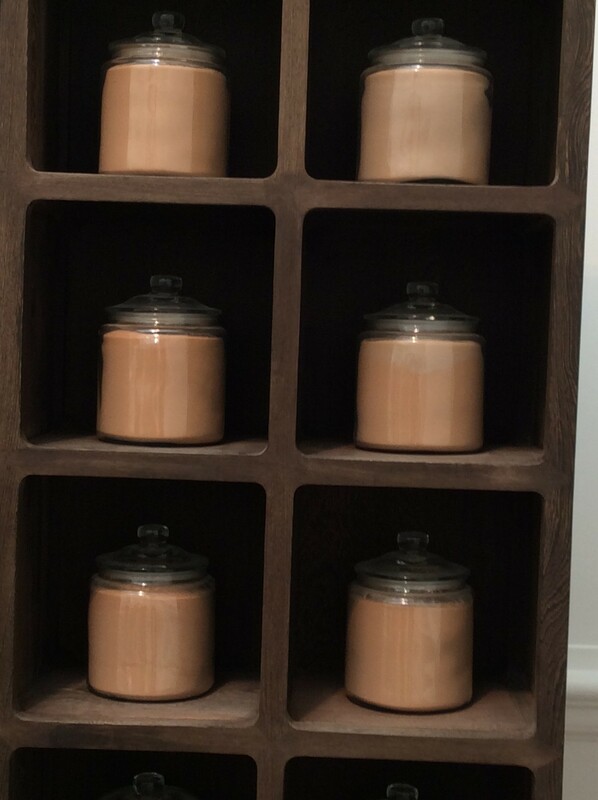 The graduates selected to exhibit at Sotheby’s in London were outstandingly talented. Many used their own family histories as the underlying theme of their work. Often it was hard to communicate with them in Beijing. Internet networks would suddenly be closed down for no reason and many used coded language to get their thoughts across. TheEye was surprised to see herself referred to in a magazine interview as a ‘hairy crab’ – apparently a compliment!! Decoded ‘hairy crab’ means someone with tenacity!! Life in China is still far from easy, particularly for creative people. This is an exciting, moving and insightful exhibition. 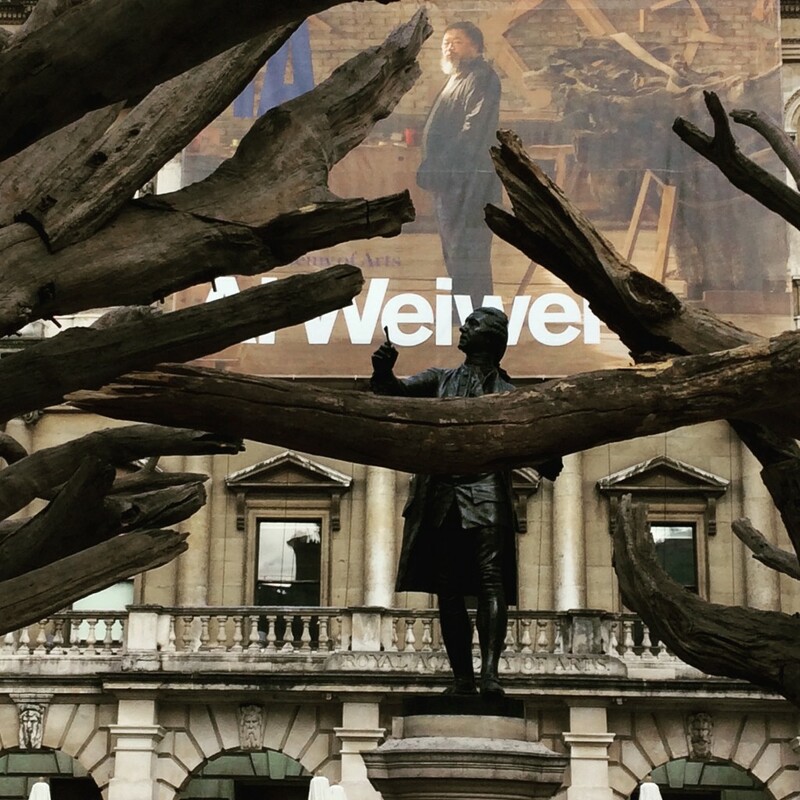 Ai WeiWei is not just an Andy Warhol style chronicler or showman. 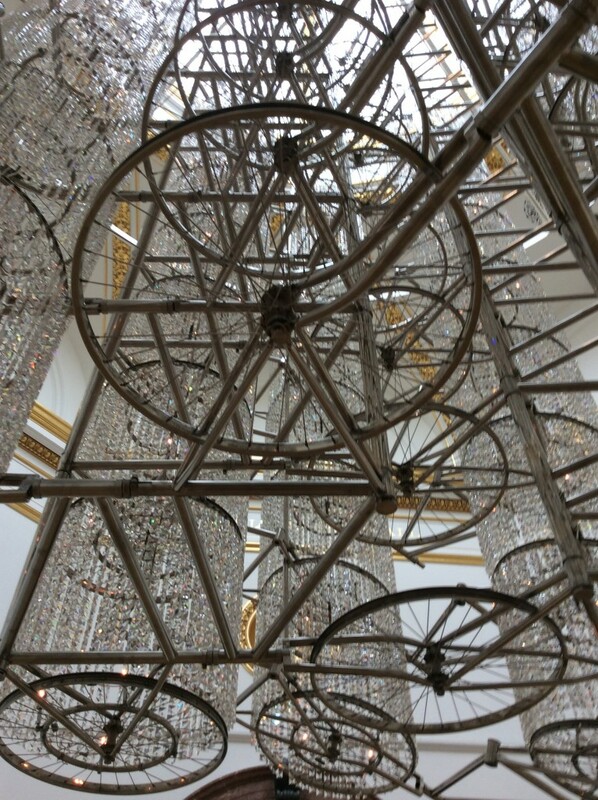 Using art and materials in his work from earthquake damaged steel to rubble from his destroyed studio, from tea to the wood from a dismantled Qing dynasty temple, he succeeds in getting the outside world to better understand the confusing and complex cultural history of his country. Is Ai a great artist? Without any doubts he is a brilliant and effective communicator. Your blog will act as my guide when I go to the exhibition-the background to his life facinating and disturbing. As usual Janice, an interesting and for me educational article. I hope the show will still be on when I get back. Janice, very illuminating. 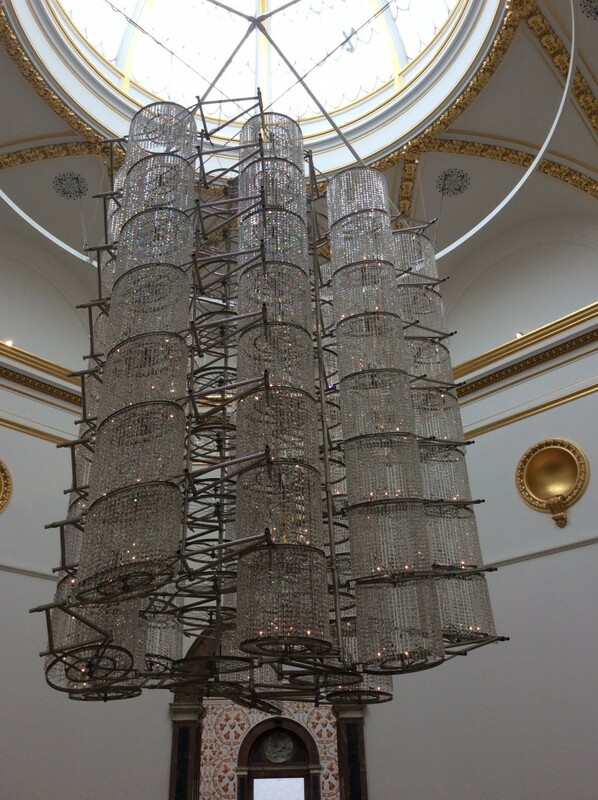 I went to the RA on Wednesday and was moved and impressed by the exhibit. You have added lustre and detail. Thank you! thank you – better than any review. I am looking forward to see the exhibition.